Alexander Fomichev is a 2nd year postgraduate student of the Department of Ecology, Biochemistry and Biotechnology of Altai State University. The main field of his scientific activity is taxonomy, faunistics and zoogeography of spiders of North Eurasia, especially Altai and surrounding territories. Expeditions play a special part in such research, so Alexander participates in expeditions every year. A. Fomichev went on several interesting expeditions in field season 2016. The first one started in April and was carried out in cooperation with researchers from the Institute of Animal Taxonomy and Ecology (Novosibirsk). Its aim was to study the arthropods’ spring fauna in arid (desert and semi-desert) territories of South Kazakhstan. The main work region was chosen to be deserts near the Ili River and offshoots of the Trans-Ili Alatau (Northern Tian Shan). 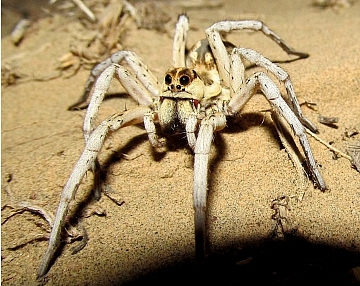 The second expedition was dedicated to the research of spiders and insects of the Dzungarian Alatau. Despite the f act that the Dzungarian Alatau is one of the greatest mountain systems of Central Asia and is more than 400 km long, its spider fauna is absolutely unexplored for the present moment. There is no information on spiders inhabiting high-mountain areas of this region. In the course of expedition A. Fomichev started filling up these gaps. Atop of the mountains, between the cliffs, slide rocks and snows he found a lot of spider species that belonged to the groups susceptible to endemism in highlands (endemics are the species that inhabit only very limited territories , for example only one mountain range). It can be expected that a lot of new unknown species will be discovered in the course of material processing. It should not be left unmentioned that the spiders of Segestriidae family were discovered. The spiders of this family had not been known in Asia north of Tian Shan. After expedition to the Dzungarian Alatau Fomichev took part in the student field period that took place in Charyshskoye Village. It allowed him to collect the materials in the highlands of Korgon Range. Alexander’s third expedition was to South-Eastern Altai, where he cooperated with Australian entomologists. In the course of that trip he managed to gather extensive materials on Linyphiidae. In September Alexander visited the highlands of East Kazakhstan Region and worked on Sarymsaqty in Katon-Karagay National Park. There the scientist covered a long walking route and collected a lot of interesting information. During the expeditions A. Fomichev collected not only spiders, but also other invertebrates. The materials will be handed to Alexander’s colleagues in Altai State University and other establishments for processing. “Field works in hard-to-reach regions of Altai and Central Asia allow us to make scientific discoveries and publish our results in leading zoological periodicals. Alexander has already published 20 articles in journals indexed in Scopus and Web of Science, including Q2 class journals. It should be noted that Fomichev’s expedition program was realized without using the university’s finance,” said Alexander’s scientific supervisor, Doctor of Biology R.V. Yakovlev.